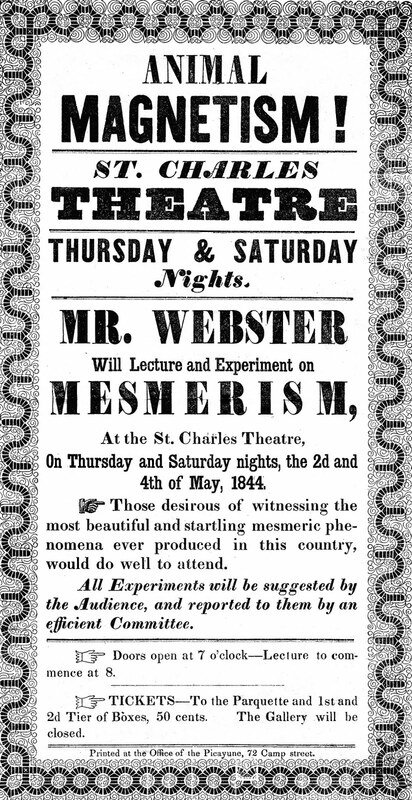 This is a scan of an 1844 printed poster advertising a performance by a traveling mesmerist. I found it recently clearing out some old work and sadly I can't conjure the mesmerist's name for certain. I believe it was Charles Webster, an itinerant showman. If I recall correctly, at various times he taught handwriting, too. It's a lovely old advertising print, I think. Click the image to enlarge and see it more clearly. 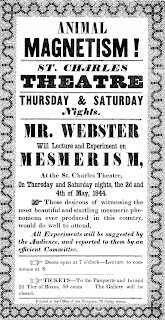 Update: With the help of a friend, we've recalled the name of the mesmerist: Jonathan Palmer Webster, aka J Palmer Webster. Webster was from a farming family in New Hampshire. He set up a penmanship school called Webster's Academy of Penmanship and Stylographical Card Drawing. A relative gave him funds for medical school, which he attended in New York until the money ran out. He also called himself an "Itinerant professor of phrenology," and wrote a book about that science. In the early 1840s, stage mesmerism was a popular entertainment. P.T. Barnum and other impresarios presented regular exhibitions. Webster began performing stage mesmerism, particularly in Virginia, the Carolinas and New Orleans, where this print is from. In towns where he exhibited he also offered mesmerism classes at as much as $50 a pop -- a hefty charge in those days. Sometimes a clairvoyant named Frederick would perform with him. For stage hypnotists of the era, clairvoyants would be put into a trance state and see things at a distance or in the future. Sometimes they would act as healers by "seeing" into the bodies of audience members and identifying diseased organs. In 1849 Webster migrated from New Orleans to San Francisco (Gold Rush, perhaps?). There he apparently worked as a physician despite not having completed his education. After that I know nothing of J. Palmer Webster, a very minor figure who left behind some great handbills and posters.